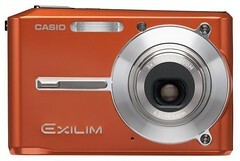 I finally broke down and purchased a decent digital camera, the Casio Exilim EX-S500 . Already I have a feeling that this is going to bring about a brand new era in my Flickrstream… one that might actually lead to real photos showing up (for a change)! Just in time for Thursday’s big party… (which somehow keeps getting bigger!). for fark’s sakes! don’t stop posting t-shirt designs! I just recently purchased the same camera and I’m loving it. With some decent light, it makes pretty decent movies too.